Johnson & Johnson (JNJ) engages in the research and development, manufacture, and sale of various products in the health care field worldwide. Johnson & Johnson is a major component of the S&P 500, Dow Industrials and the Dividend Aristocrats Indexes. One of the company’s largest shareholders includes Warren Buffett. JNJ has been consistently increasing its dividends for 46 consecutive years. 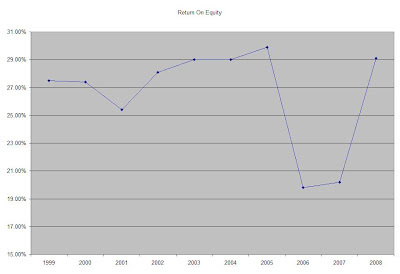 From the end of 1998 up until December 2008 this dividend growth stock has delivered a 5.60% annual average total return to its shareholders. At the same time company has managed to deliver a 13.40% average annual increase in its EPS since 1999. The ROE has remained largely between 20% and 30%. Annual dividend payments have increased by an average of 14.10% annually since 1999, which is much higher than the growth in EPS. Analysts are expecting flat EPS for 2009 compared to 2008, given the state of the economy and the erosion of market share by certain products losing patent protection. The strong US dollar could potentially hurt sales, as over 50% of Johnson & Johnson’s revenues are derived internationally. A 14% growth in dividends translates into the dividend payment doubling almost every five years. Since 1974 JNJ has indeed managed to double its dividend payment almost every 5 years. The dividend payout has remained in a range between 35% and 45%. A lower payout is always a plus, since it leaves room for consistent dividend growth minimizing the impact of short-term fluctuations in earnings. JNJ is attractively valued. The stock trades at a price/earnings multiple of 12, has a low DPR and the current dividend yield is the 3% minimum threshold that I have set. I do not see the recent reduction in Berkshire Hathaway’s stake in JNJ as a negative. Buffett has sold at the wrong time before as well. Furthermore he could afford to invest his proceeds in preferred shares with warrants, which deliver him 10%-15% dividend yields.